3-D Tropical Island Luau TIKI HEAD MASK TOTEM Dimensional Yard Sign - Beach Pool Party Voodoo Wall Hanging Door Plaque Window Decoration. 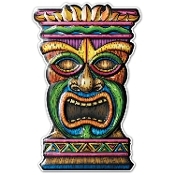 New 18-inch tall x 11-inch wide, art-form plastic , attached to a 24-inch (60cm) long pine wood stake, bright multi-color Hawaiian Tahitian theme Tiki Bar decor. 3-Dimensional TIKI HEAD MASK DOOR PLAQUE YARD SIGN Wall Hanging Luau Party Decoration Plastic Art Form is the perfect decor for any tropical Hawaiian island Luau celebration or beach party! Not flat like most other luau decorations, printed and formed to the shape and detailing of a genuine tiki idol. Made of thin, high quality vacuum-formed molded plastic, with brilliant color graphics. Lightweight, easy mounting on wall, posts, doors or other flat surfaces. Approx. 18-inch (45cm) tall x 11-inch (27.5cm) wide x half-inch deep, attached to a 24-inch (60cm) long pine wood stake. Use 2 or more to flank the entrance to your own tropical paradise! Use and Care Warning: Plastic Sheet will melt under strong heat, resulting in an imprint on the surface underneath. Avoid prolonged exposure to strong sunlight or spot light, and keep away from torches, candles, heater or stove. Size: 18-inch tall x 11-inch wide (45cm x27.5cm), attached to a 24-inch (60cm) long pine wood stake.